​Jonagold is one of the best tasting and most versitile apples. Most Jonagold apples now have high red color, but still the same great taste and quality. Jonagold Apple is becoming one of the important apples in the marketplace because of its excellence as a multi-purpose apple. It is a great fresh eating apple that is quite crisp, juicy and full of slightly tart flavor. It is a good cooking apple too. It is large fruited, but still should be thinned adequately to ensure consistent yearly production. 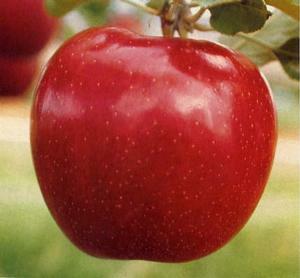 Jonagold was introduced in 1968 by the apple breeders of Cornell University Geneva Station where many other famous varieties were conventionally bred and introduced. It is a cross between Jonathan and Golden Delicious, hence its name, and has some of the best characteristics of both. Originally the Jonagold strain was mostly golden colored with some reddish blush, but over time natural mutations have been selected giving it a more and more red color, until now it is almost an all red apple. This may have slightly changed the taste spectrum of the apple, since Grandpa feels that there is usually more bitterness in the red skin of apples. However, this could also mean that there are more anti-oxidants in the skins. Regardless, a properly harvested and stored Jonagold is an excellent eating experience. Jonagold is a triploid variety, so it needs other diploid or regular apple varieties to pollinate it properly. It is not a good pollinator unless it is acompanied by other regular varieties. It is a mid-season bloomer, so can be pollinated by almost any other non-triploid variety. Since the vast majority of apple varieties are non-triploid, proper pollination shouldn’t be a problem. It is usually a fairly consistent yearly producer if thinned properly, but if over-cropped severely one year it may not come back with much crop the next. The Jonagold tree is more vigorous than most with strong branches that tend to grow outward rather than upright. It is easy to train and maintain. Of course, it is susceptible to scab, mildew and most other apple diseases and insects. It is fairly susceptible to fire-blight, so care should be taken to get rid of any fire blight strikes that may occur. Keeping the tree healthy, but not over-vigorous helps. Fire-blight will typically get started during bloom time, so be on the lookout early in the season. After harsh weather that may cause blowing sand or hail to open wounds in leaves and soft stems. If space is a limiting factor in your garden, Jonagold will perform quite well on more dwarfing rootstocks. Avoid semi-standard rootstocks unless you have poor soil that doesn’t allow normal, vigorous growth. A Jonagold on a semi-dwarf root like EMLA 7 can mature into a tree that is as wide as it is tall and can easily fill in a 12-14 foot spacing unless you don’t keep it properly prunned. Jonagold matures in mid-season after Golden Delicious— usually mid-September to early October depending on your location. It will keep quite well in refrigerated storage if picked slightly immature. The taste will develop in storage. If left to hang on the tree too long, the skin may start to get a “greasy” feel on the tree and also in storage, however the taste is unaffected. If you wish to keep your Jonagold longer into the winter, pick some earlier in the mid-season and then use the remainder on the tree for immediate use in the fall. Jonagold is fairly hardy and is rated for Zones 4-8, but isn’t quite as hardy as its parents Jonathan or Golden Delicious. Avoid planting it in cold zones or sites were cold air in the winter is known to collect. Sub-zero temperatures in the -20s may result in some tree damage. Grandpa has Jonagold available for both fall and spring planting. Browse more of Grandpa’s favorite varieties.